Punch-Out!! (パンチアウト! !, Panchi-Auto!!?) is a boxing video game for the Wii. 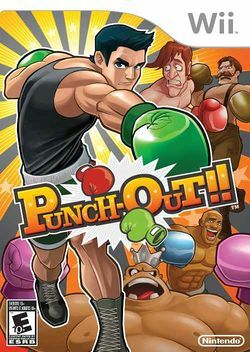 It is the newest game in the Punch-Out!! series, and it's a remake of the NES game of the same name, with new and old characters, new moves, and a little bit deeper storyline. It was developed by Canadian developer Next Level Games. It was first revealed at Nintendo's conference on October 2, 2008. It was released on May 18, 2009. It was later released as a downloadable title on the Wii U eShop on January 22, 2015. Glass Joe, Von Kaiser, and King Hippo are all shown as opponents of the Minor Circuit, and the boxart shows a new opponent named Disco Kid. In an interview on October 9, Charlie Scibetta, Senior Director of Corporate Communications for Nintendo of America, confirmed motion control will be used in this game. Nintendo of America announced that NES controls using on its side will be available. Wii Balance Board support has also been confirmed. It also has been hinted that the game will have many unlockables, like characters, ring environments, challenges, victory animations, and more. It has also been stated that this game is the first game that an internal Nintendo development team ran into a problem with space on the Wii's DVD, but hinted that there will be a lot of unlockables. This page was last edited on 10 July 2017, at 11:06.